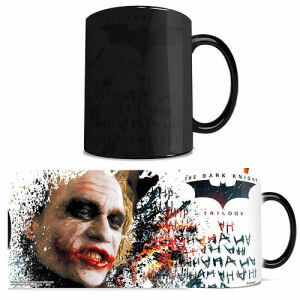 We have Just Sold out of Batman Dark Knight Trilogy The Joker Morphing Mug. Not to Worry! Fill in the Notify me When Available and you will be the first in line for our restock of Batman Dark Knight Trilogy The Joker Morphing Mug !! From the Batman collection by Morphing Mugs. Batman Dark Knight Trilogy The Joker Morphing Mug. Holds 11 Ounces. Watch as the heat-activated process reveals the hidden image in full vivid colors! Not dishwasher or microwave safe.